Home › News › Ecovis Vesiir is Charter Member of the Association of Estonian Accounting Firms. Ecovis Vesiir is Charter Member of the Association of Estonian Accounting Firms. Ecovis Vesiir signed today, 16th of June 2010 together with other charter members the memorandum of association of Estonian Accounting Firms Association (acronym in Estonian: ERPEL). ERPEL’s main objective of activities is to improve the quality of accounting services and raise the awareness of entrepreneurs about this service. In Estonia there are currently around 1000 companies providing accounting services. Therefore the content and level of accounting service varies significantly. The goal of ERPEL is to develop an activity plan for creating accounting service standards, to contribute to the development of the area of accounting and evaluation of its members every two years. 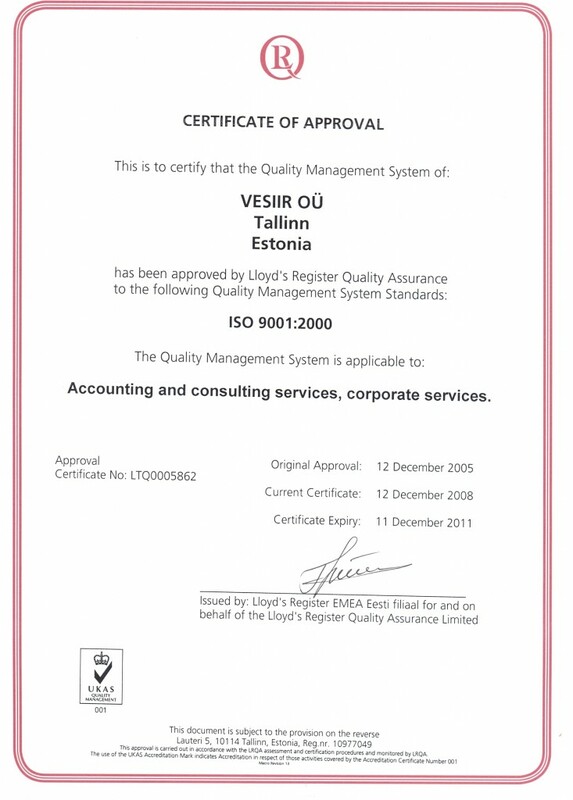 „ 2005 Ecovis Vesiir received ISO 9001 quality certificate as the first accounting company in Estonia and one of the first ones in Europe. We sincerely hope that we can contribute to the development of Estonian accounting standards,“ mentioned Eero Käärik, member of the management board of Ecovis Vesiir. The members of the Association of Estonian Accounting Firms can be legal persons, who’s main area of activity is accounting, they must have at least 2 years of experience, minimum of 5 employees and their quality management system must meet the standard of ERPEL. Eero Käärik also pointed out that one of the prerequisites is also the existence of liability insurance. Ecovis Vesiir was established in 1997 as accounting service company. Since 2005 the company has ISO 9001 quality certificate. 2008 Ecovis Vesiir joined the international chain of accounting companies- Ecovis. There are 20 employees in Ecovis Vesiir.